Push to stop drivers from speeding near school. INDIANAPOLIS — Danny White, who lives along Sante Fe Drive on the city's southwest side, says people are constantly speeding by Liberty Early Elementary School. White is using a radar gun to prove it and hopefully get them to stop. "I've taken it out of the car before because I thought, 'I can't believe this I've got to see it,'" White said. "And I've clocked one out at 53 mph by the time they got at the end of the block. And this is a 25 mile an hour zone." White has a radar gun because of his job as the Director of Motorsports for Purdue University. Every now and then he stands along his street to see just how fast people are going, and brings that information to police so they can step in and help. "I have went to the west district, to the police chief. I went to the Decatur school police," he said. "I went to the superintendent of Decatur schools. And I have talked to all of them about this issue, and seem to get nothing." White fears with no strict enforcement, drivers will continue to speed by. "You've got people walking their kids up and down the sidewalk to the schools. So it kind of, I think it presents a safety hazard. It's something to be concerned about," White said. 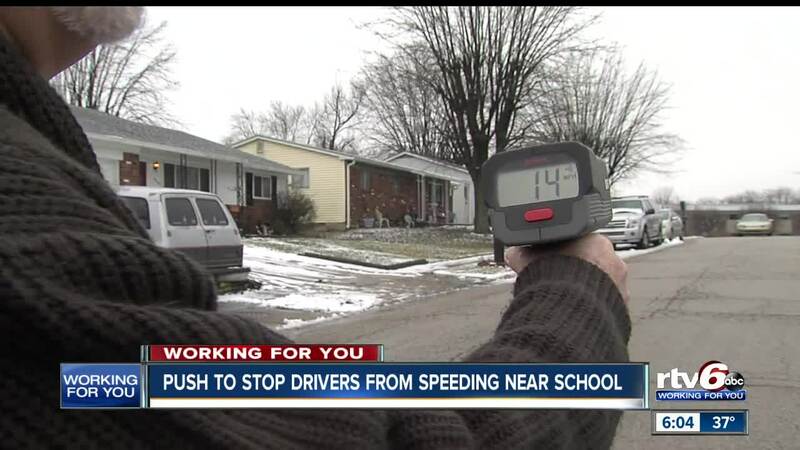 RTV6 reached out to the Indianapolis Metropolitan Police Department, asking if they can step up patrols in the area, or have a stronger presence to potentially deter drivers from speeding. They say they have made their traffic division aware of these concerns. RTV6 plans to follow up with this story.